ON THE LINE: March 2014 edition includes groups trying to repeal the death penalty, raise the minimum wage, stop deportations! 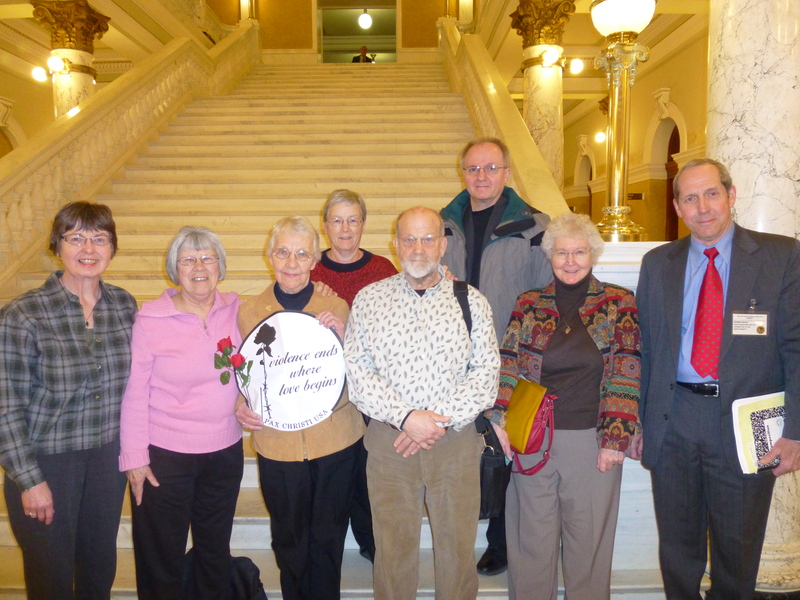 PAX CHRISTI SOUTH DAKOTA MEMBERS WORK FOR REPEAL OF DEATH PENALTY: (from Leona Weiland) As the South Dakota House State Affairs committee met to discuss the death penalty, PC South Dakota members worked on the repeal effort, including circulating this letter to their elected officials: On behalf of five chapters of Pax Christi in South Dakota, we follow Pax Christi USA in stating that we follow the non-violent Jesus. 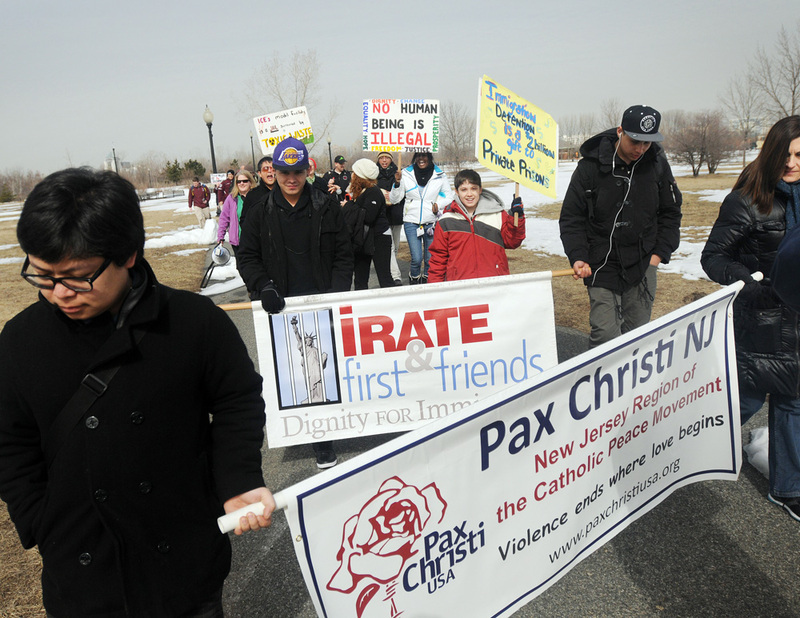 The international Catholic peace movement, from the Latin for “peace of Christ,” began after WWII. 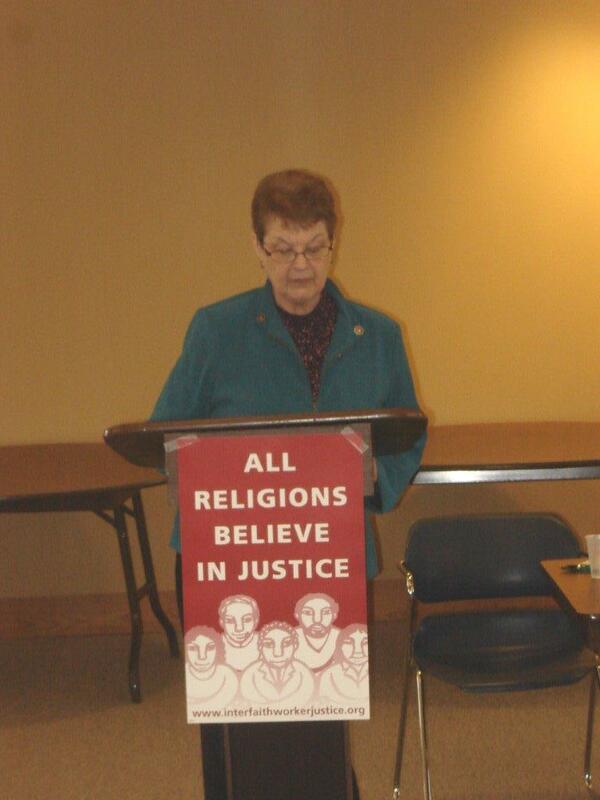 We focus on issues central to Gospel values of life, love, truth and justice. In our prayer, study and actions, we respect the gift of life given by God who teaches that all life is sacred, from beginning to natural death. Following the example of Jesus in the Gospels, we commit ourselves to God’s way of caring with compassion, forgiveness, mercy and love. Please note our attached Statement for Repeal of the Death Penalty in our state and the many who have signed in support of it. PC FLORIDA JOINS CLEAN WATER EFFORT: (by Carol Ann Breyer) Citizens and environmental activists from around Florida gathered on the steps of the historic Old Capitol in Tallahassee on February 18 to demand legislative action to protect and restore Florida’s endangered springs, rivers, and bays. About 200 people attended the gathering for “Florida’s Clean Water Declaration” campaign that was launched last year after toxic algae blooms appeared in the Indian River Lagoon… Six Pax Christi Florida members and supporters from South Central and Southwest Florida were present at the event. Karen Dwyer spoke emphatically about the drilling threat in the Naples area which has been challenged by Pax Christi members. 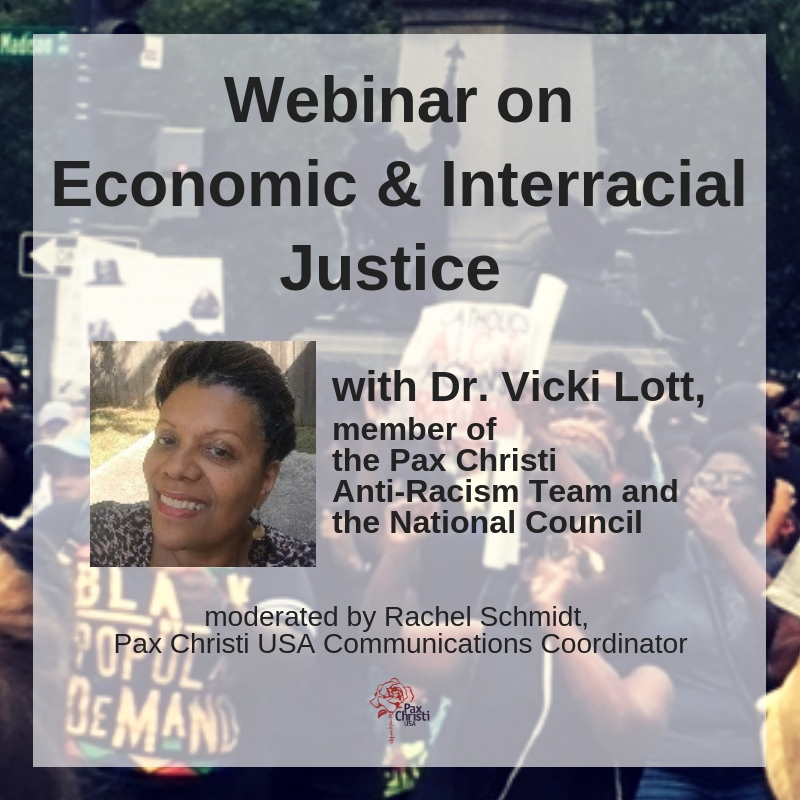 In 2013, Pax Christi participated in the effort to secure signatures for a proposed Constitutional Amendment on Water and Land Conservation that would dedicate finds to acquire and restore Florida conservation and recreation lands. 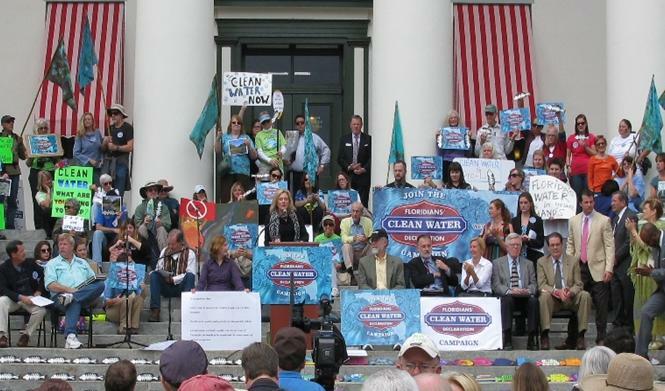 PCF Council Members, Carol Ann and Lee Breyer (right of podium) at Clean Water Rally at Florida State Capitol. (photo courtesy of PCF). James Vernon McVay, plead guilty but mentally ill to first-degree murder in the July 2011 death of 75-year-old Maybelle Schein. Jurors are currently being interviewed to hear the penalty phase of the case and will decide whether Mr. McVay is eligible for a sentence of death or life in prison without parole. The law of South Dakota requires only that they consider a death sentence, not issue one, a death penalty is not mandatory in a murder case. Jurors who are conscientious objectors are denied jury duty. The judge appears to insist that jurors be willing to impose the death penalty. Stating, he wants “middle of the road’ jurors. The public defender asks for the requirement ‘to consider the death penalty’ be met. The trial is being held at Minnehaha Court House, 425 N. Dakota Ave. Sioux Falls, South Dakota, 57104. Mr. McVay has a 20 year history of being incarcerated and committing crime. He escaped during a previous incarceration. He was interviewed by the Secret Service two (2) years prior to this crime for threats to V.P. Joe Biden. He was incarcerated in the state of Nebraska , transferred to the South Dakota State Penitentiary. His prison records did not follow him. He was subjected to isolation for two(2) months. Juan Mendez, the (UN) United Nation’s special rapporteur on torture is of the opinion that no mentally ill inmate should be locked up alone. Prison officials have acknowledged Mr. McVay as being mentally ill. He was put on parole, seen by a case manager, evaluated by a mental health professional, met with a release coordinator. He was transferred to the community transition program on June 30th. On the morning of July 1st — the day he killed Maybelle Schein — he walked away from custody. ‘He was sleep-deprived, under the influence of drugs, alcohol and influenced by his psychosis…thus statements were not voluntary.’ His public defender, lawyer Traci Smith stated. Mr, McVay had told police officers and a Madison TV reporter about the murder and his presidential assassination plot after being read his Miranda Rights. He also stated plans to murder again and again. At the time of arrest he stated he would do whatever necessary to receive the death penalty. Mr. McVay has since shown remorse, said “I’m sorry’ to a perspective juror who knew the victim. The only way to demonstrate your objection to this death penalty is to attend the trial in person; before the jury, once it is seated. You will not be able to voice this during court. Your reputation, belief as a conscientious objector and/or your celebrity may be able to convey to the jury your opinion, and hopefully influence them. If you wish to stand up for this man, please contact me at (818)939-4004 or (605)731-8539 for details on the trial start date. If you are unable to attend, please ask others to do so. If you’d like more details pls call. sincerely & briefly, Pat Hyle 3511 S. Gateway blvd #110 Sioux Falls, South Dakota 57106. Please wear something orange to court, as Mr. Mcvay does while incarcerated in prision.